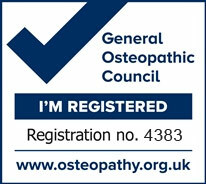 I am an osteopath with over 18 years experience, working from my home in Stratford-upon-Avon. Whether you are looking for an osteopath or trying to decide whether osteopathy is right for you, I hope the information here can help. If you would like to know more I would be very happy to talk to you in more detail about your particular situation, please feel free to get in touch. Osteopathy is a gentle and effective hands-on approach to healthcare, based on the principle that the way your body moves influences how it functions. Osteopaths are highly competent healthcare professionals, recognised by the NHS as fully qualified to diagnose and treat independently. Babies and children respond very well to osteopathic care. Treatment using the cranial approach is gentle, safe and effective for babies and children, assisting the natural ability of the body to release stresses and tensions. I work from a clinic that I run from my home in Stratford-upon-Avon. Appointments are available everyday of the week including evening, with the exception of Friday and Sunday. I also work in practices in Solihull and Tamworth.